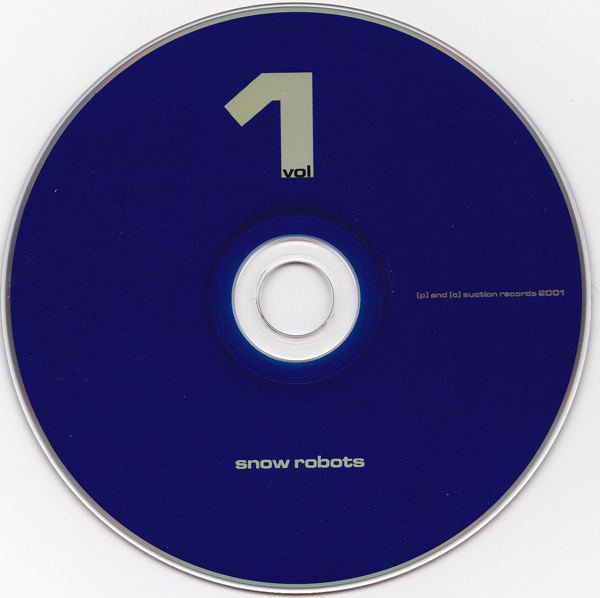 Snow Robots Volume 1 is a retrospective compilation CD from Canada's premier source of robot music, Suction Records. Suction Records was founded in early 1997 by like-minded robot music composers Lowfish (Gregory de Rocher) and Solvent (Jason Amm). This CD compiles Suction's out-of-print vinyl releases from 1997 in their entirety and also features several exclusive goodies, both new and old. Suction Records' first 2 vinyl-only releases from 1997 highlight their "distortion pedal new wave" beginnings. These tracks by Solvent, Lowfish and David Kristian are now available for the 1st time on CD. Originally brought out of the woodwork by Aphex Twin's Analogue Bubblebath material, the Suction robots joyously indulged in raw, distortion-pedal analog madness. But this was no Rephlex knock-off, for the Suction robots had already built up an impressive resume with several years of bedroom-studio experience and are well-versed in the early works of Cabaret Voltaire, Human League and Skinny Puppy. The results are dark and filthy but with a reckless sense of enthusiasm that will charm. To compliment the chaos, Suction have rounded out Snow Robots Volume 1 with six variations on Suction's patented melodic electro-pop theme: Two pre-Suction tracks by Gregory de Rocher — soothing, melodic and timeless electronica recorded in 1996 under the pseudonym Pest(e); a remix of Solvent by Detroit's mutant techno-pop duo, Adult., who also run the seminal Ersatz Audio label; a remix of Lowfish by Germany's Lali Puna — moody electronic pop with paranoid female vocals (their debut LP was released on Morr Music/Darla); and a brand new, exclusive track each from Solvent and Lowfish — two melodic electro tracks that are definitive Suction.